Being brought up on South African political theatre that had a clear function in the liberation movement, I was trained to think in a certain way about artistic production. Why was the work being made? Who was it being made by? How was it being made? No Feedback brings together a number of strands that have concerned me since beginning my creative practice. Making work that is socio-politically relevant, making performance that plays with the relationship between performer and audience, and developing work with a team through an inclusive methodology. I remember studying The Island by Fugard, Kani and Nshona and being struck by its urgency, simplicity and playfulness. They had to break apartheid laws as well as conventions of theatrical production to make and perform the play. It was illegal for black and white men to work together in this way and relatively new for actors to co-author a show. This developed my interest in how I could make work about the issues that are significant in my world now, so that I could perform in something that I cared about. On moving to London I realised that the things that interest me are big, global systems, habits and ideas that are not necessarily specific to one place. I am interested in violence, how human beings engage in it on a large scale. I am interested in migration, how as a race we are used to moving and why that is now becoming problematic. I am interested in belonging, how we come to belong and why we want to. I am interested in memory, individual, collective and selective. There are artists that I really admire who are grappling with how to deal with these ideas creatively. I think that Richard Mosse's “Infra”, a collection of photographs of the Democratic Republic of Congo through an infra red lens, in which the lush green of the landscape and militia in camouflage uniforms are turned a deep pink, truly encapsulates the violence that controls the country by making it something arrestingly beautiful. One of the things that has fascinated me for a long time is genocide, not one specific genocide, but that fact that humanity has repeatedly taken part in this horrific action. In 2012 I went to Cambodia, largely due to my interest in the Cambodian genocide in which an estimated one and a half to three million people were killed. When I returned, I knew I wanted to make No Feedback with a group of people who were similarly intrigued and repelled by the subject of genocide and all that it opens up about who we are as human beings. The No Feedback team all have individual interests in being part of the project as well as skills that offer a richness. Apart from being performers and performance makers we are anthropologists, biologists, facilitators, writers, teachers, designers, puppeteers and dancers. Part of my work was to find a way of including this wealth of interests and concerns within how we made the show. We had to work openly enough to make this a group vision but be focused enough to actually produce something. There is a lot of trust in our process, as when we started we did not know where we would end up. I have taken a lot from the work of Forced Entertainment and in particular Tim Etchell's book Certain Fragments as well as Body, Space, Image by Miranda Tufnell and Chris Crickmay. The way these artists and researchers unpack and explore the devising process provides a springboard for developing our own model for creating work. All members of the team have engaged with the project generously and from their own perspective, so much so that this is really not my project anymore, but rather the formation of a performance company. It is incredible to be part of a process where we are all grappling with the difficulty of what we have taken on and trying to find a successful way of working together. Finding the document The Ten Stages of Genocide and using it as an anchor for our research and development was an important methodological choice. This document is written by Gregory Stanton from Genocide Watch and is a working document for global genocide prevention. It has become the 'spine' of the show, the thing that holds it together. We have been privileged to have Greg's support for No Feedback and the constant reminder of the gravity of the subject we are dealing with. What The Ten Stages of Genocide does so well is to argue that genocide is a process, starting from classifying one group of people as different to others, working through persecution and the mass killings that we commonly consider to be genocide, and ending with denial of these atrocities. The Armenian genocide and Turkey's lack of recognition of it have been spoken about a lot recently due to its 100 year anniversary. The framework of The Ten Stages allows this denial to be viewed as part of the genocide itself, rather than something after the fact. This seems like an important perspective and one that is key to genocide prevention in the future. If I leave these conceptual and methodological concerns aside for a moment, what really drives me to perform is the space between me and the audience, the space where a connection can be made, the shared time and space that makes performance different from all other art forms. This idea is brilliantly captured by Marina Abramovic's The Artist is Present, in which that is all there is, the space between the artist and the single audience member who simply sit across a table from each other. I want to take from this mode of "performance art" and make the connection between the performer and the audience the most important element of the show. This is the driving principal behind the immersive form of No Feedback. Can an artwork sit somewhere between Abramovic and the truly immersive worlds of Punchdrunk's shows? That is what I am trying to find out. My work to date has played with the performer-audience connection in various ways by giving the audience different amounts of agency. No Feedback continues this exploration by making the audience's role essential to the completion of the piece. Inherent in this show is the risk of trusting the audience to make the show with us, and of asking them to engage with the difficult themes and ideas that it brings up. We want people to have fun and laugh and play with us and then leave thinking and talking about what it has triggered for them. I trust that this is the beginning of a life for the show that will take many different forms and functions, being experienced across schools, community groups, museums, as well as arts venues, allowing us to demonstrate that this conversation involves all of us, from the playground to wherever our evolution takes us. We are partnered with a number of wonderful charities; the Anne Frank Trust, Aegis Trust, Wiener Library and Remembering Srebrenica, their remarkable work attempting to prevent, and remind us of, continuing atrocities, from the Holocaust to Rwanda to Srebrenica, allows us to ground ours. No Feedback is an immersive theatrical event that combines cutting-edge human rights research with high-quality, non-traditional performance and premieres at Theatre Delicatessen in May 2015. More information about the show can be found at http://theatredelicatessen.co.uk/js_events/no-feedback/. Nina Feldman is a multi-disciplinary artist trained in performance making, physical theatre and stage design. In her native South Africa she developed an enthusiasm for performance that is driven by the body in space and has political and social weight. She has experience in diverse fields such as music and lighting and brings these skills into her performance making. 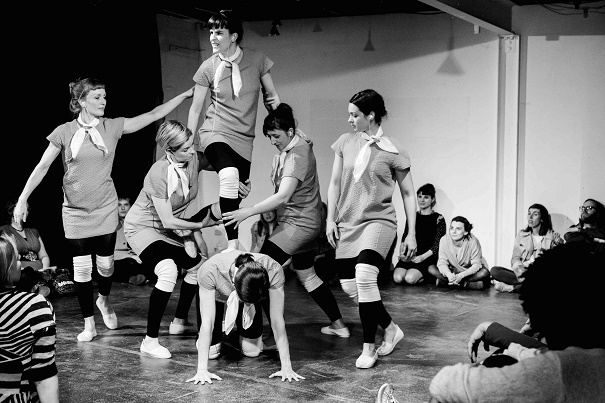 In 2012 she developed the project Hands Across The Sea (The Yard Theatre, July 2012), through which she continues to explore communication with audiences in time and space and using performance to bring people together to think in new ways.